Even Rangström has a very personal style. 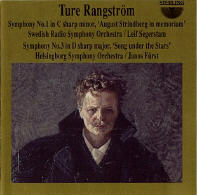 The Strindberg symphony is a dark, intense piece of symphonic writing. The big fanfares is somewhat reminiscent of Rimskij-Korsakov. There is a dark, brooding quality in Rangströms music. Easy to discover in the second movement in the Strindberg symphony.